US Army/Sgt. 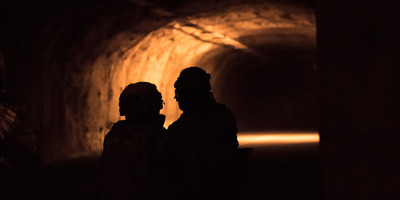 Patrick EakinUS soldiers make their way through a subterranean tunnel during an exercise on December 15, 2017. Creating a Space Force is a top priority for the Trump administration. 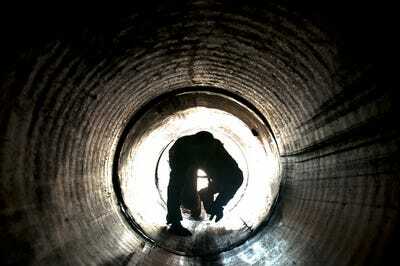 But officials at the Pentagon have expressed more concern about fighting in underground environments. And DARPA is getting ready to launch a three-year competition to find a new kind of technology that will spare humans from the dangers of subterranean spaces. President Donald Trump’s proposed Space Force aims to tackle the vastness of the heavens, but Pentagon planners are more worried about sprawling and unpredictable underground spaces here on earth. As troops and first responders face the dangers underfoot, DARPA is looking for science-fiction inspired solutions. DARPA has started finalising teams for its three-year Subterranean Challenge, a competition that seeks new systems that can map and search underground areas rapidly that could assist with missions from urban warfare to emergency response. “Subterranean environments remain, in many ways, a hidden domain in spite of being broadly relevant across a range of military and civilian applications,” the agency said in an amended announcement released in March. Different underground subdomains – tunnel systems, urban underground environments, and cave networks – can present varying challenges that would hinder situational awareness even under ideal circumstances, the announcement says. “The multi-faceted nature of these problems presents both a need and an opportunity for breakthrough innovations for public safety scenarios as well as a wide range of military, academic, and commercial applications,” like building inspections, resource extraction, and scientific exploration, the announcement adds. DARPA even put out a slick video underlining the challenges and the goals of the competition. The competition will consist of two tracks. Participants on the systems track will need to develop technology like a tracked vehicle or walking robot that can traverse a physical test course. Teams on the software track will have to present their work in a simulated environment. They will have to demonstrate their technology in each of those three subdomains – first one at a time, and then in all three at once – earning scores based on speed, manoeuvrability, the accuracy of the maps they produce, and their ability to identify objects. DARPA has already given out millions to competitors. Virginia-based firm Scientific Systems Company was awarded a contract worth up to nearly $US500,000 on July 31. On August 8, Michigan Technological University got a contract worth up to $US750,000, and Virginia-based company iRobot Defence Holdings received an award of up to $US4.46 million. The varied nature of the subdomains DARPA has designed the competition around means any proposal will have to manoeuvre through tight spaces, rugged terrain, man-made impediments, and natural obstacles – sometimes all on the same missions. Things like tunnel-boring machines already exist for big jobs, but they likely won’t be suited for the jobs DARPA has in mind. Proposals for “smart” cities have included underground robots to deliver goods and remove waste, but those are systems built for controlled environments. Science fiction has produced other examples of robots – like the spiders in “Minority Report” that skittered through buildings to identify the people inside – that could serve as inspiration for DARPA’s competition. US Army/Sgt. Matthew ThompsonAn Army engineer scurries into a confined space during subterranean training at West Fort Hood’s underground training facility, November 21, 2013. But the final result may build off something already present in nature. Several years ago, scientists working on the Open Worm Project were able to use their software, which was based on the neurons in a worm’s nervous system, to control a Lego robot, making it move and behave like a real worm. In a paper released in mid-2017, researchers at Stanford detailed their design of a soft robot that could go into confined spaces and cover the distance by growing – like a vine – to provide imagery or to expand to create more space.